In this retelling of Mark Twain's The Adventures of Huckleberry Finn, Tim DeRoche dares to imagine that Huck Finn is alive today. Chased by his vengeful and psychotic father, Pap, Huck escapes down the concrete gash that is the Los Angeles River with his friend Miguel, an illegal immigrant who has been falsely accused of murder. Riding the dangerous waters of a rainstorm, the two fugitives meet a strange cast of Angelenos both animal and human who live down by the river. And they learn the true value of love and loyalty. 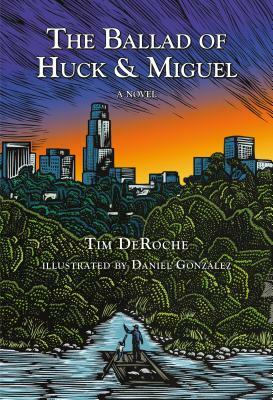 The Ballad of Huck & Miguel is not only a thrilling urban adventure, but also an inspired tribute to one of the most beloved novels ever written. Tim DeRoche is a writer, consultant, and filmmaker. A graduate of Pomona College, he lives with his wife, Simone, and two kids in the Mount Washington neighborhood of Los Angeles. He emigrated to California from Milwaukee, Wisconsin. Daniel Gonzálezis a printmaker based in the Highland Park neighborhood of Los Angeles. He studied graphic design at the California College of Arts and Crafts and UCLA and occasionally teaches printmaking at Self Helf Graphics & Art. His family comes from the small town of El Teúl, Zacatecas Mexico. He is a native of Los Angeles. "Every bit as thrilling, provocative, humane, and laugh-out-loud funny as the original." "Channels the timeless voice of Huckleberry Finn to tell an engrossing and amusing adventure story for our times." "Lovingly detailed linocut illustrations mark Huck and Miguel's vivid journey along the L.A. River." "A thrilling reboot of a classic and a magical urban adventure." "Captivating and compelling. A bold reimagining of Twain’s novel."